Ear infections have a high chance of occurring in dogs as they are extremely sensitive and require regular maintenance and cleaning. This often causes them distress and discomfort. Luckily, there is a quick and easy solution to put your dog out of pain. 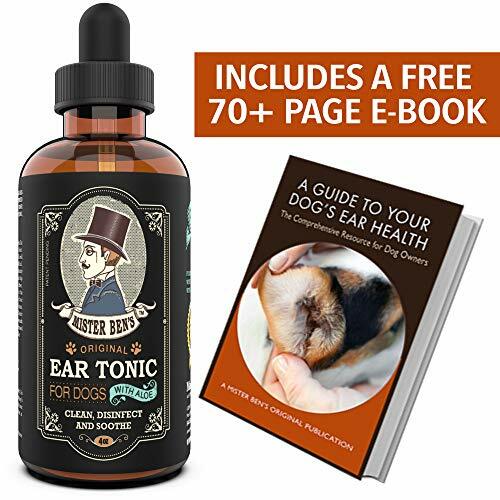 Some of the best dog ear drops serve as medication to soften the wax present in the dog’s ear, cure any infection, calmly heal your pet’s ear and kill ear mites. Hence, ear drops will provide comfort to your pet and allow it to be free of agony for an extremely reasonable price without having to take it to a vet on multiple occasions. 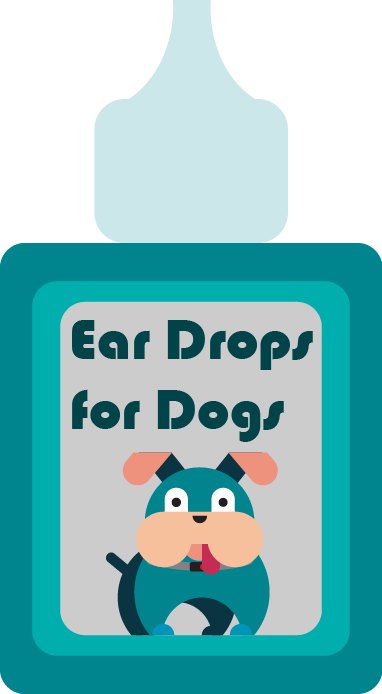 Based on our experience, we have created a list of Top 5 Best Ear Drops for Dogs. 1.3 What to Do When You Find an Ear Infection in Your Dog? 1.4 How to Clean Your Dog’s Ears? 1.5 How to Prevent Ear Infections? Your dog might be scratching its ear a lot, including the area around the ears, more often than usual. One of the most obvious signs of an infection is the discharge being released from the dog’s ear. It may be brown, yellow or blood red. You may also notice a distinctive smell or odor coming from your pet’s ears. The area around the ear along with the ear itself might turn red. Swelling in that particular region may also be observed. You may need to search the inside of the dog’s outer ear for scabs or crust-like features. Another sign that may be noticed immediately would be the balding of the hair or fur around your dog’s ears. You may also notice a hearing loss if your pet isn’t responding or reacting to your calls often. Your pet’s behavior may also reveal signs of discomfort. If it’s moving around in circles repeatedly or rubbing its ear or the area around the ear on the floor or any surface, you may need to check for an infection. If your dog is stumbling or not stable enough to maintain its balance, it can be a sign of an ear infection. If your pet has an infection, it might also have unusual eye movements which would occur frequently. During an ear infection, your dog is more likely to be scratching and itching. If any of these symptoms occur in your pet, you need to get on top of it as soon as possible and treat your dog as it causes it a great deal of discomfort. As dogs have a highly sensitive area around their ears, it makes them an easy target for an ear infection. Statistics show that one in every five dogs suffers from the ear infection at least ones in its life. Dogs usually have infections caused by excessive yeast (Malassezia), which can develop due to an excessive amount of earwax or cerumen. Another cause is exposure to bacteria known as staphylococci or Pseudomonas, which can be caused by swimming. Hormonal conditions, nutrition, and autoimmune diseases are also many of the leading cause of infections. The infection may range from mild inflammation to a severe middle ear infection, which is also known as otitis. Otitis is most common in dogs in comparison to other pets. Dogs genetically possess a sensitive skin and glands in the canal. As dogs naturally have thick hair, it restricts airflow in the canal and makes it more likely for an infection to occur. It is important to be aware of the fact that in areas where the climate is more humid, dogs are more likely to develop otitis, while one in every six dogs with an external ear infection can further develop otitis. Furthermore, dogs who already have allergies to anything particular are comparatively more likely to get otitis. Research shows that eighty percent of dogs with allergies can develop otitis. This is due to allergic reactions causing heat and inflammation in the dog’s neck, back, ears and feet. The inflammation and heat in the ear further cause an increase in yeast growth, which later on leads to otitis that is chronic. The leading cause of otitis is bacteria and yeast cells. As ears are areas which have the least number of bacteria and yeast, the presence of these elements has the tendency to cause otitis. This infection takes place when the bacteria and yeast cells increase in a great amount and/or are replaced by pathogenic organisms, also known as disease-causing organisms. It is more common to get this infection in the region of the outer ear as it is more exposed to germs, bacteria, yeast and ear mites. It may be due to your pet playing out in the field or having any contact with natural water bodies. However, if this infection is left untreated and unattended, there is a high chance that it will spread to your dog’s inner ear through the eardrum. This is due to the eardrum becoming porous over time as the infection is left untreated. There is a chance it may not show initially. What to Do When You Find an Ear Infection in Your Dog? Once you find an ear infection in your dog, it is necessary to act on it immediately and take care of it as soon as possible. Neglecting this would increase the spread of the infection which can have severe consequences as it is very painful for your pet. You must refer to a veterinarian and get your dog checked as soon as possible. After that is done, you can treat your dog at home using any brand of dog ear infection medication that suits your needs the most. You must also make sure that your pet isn’t exposed to open bodies of water or any unhygienic environment. It is extremely important to keep your dog in a safe, clean space so that the infection can go away in a short amount of time. All dog owners are aware of one simple fact that dogs do not like to get their ears cleaned. However, it is crucial for you to take care of your pet’s hygiene, even when it is not cooperating. For dogs to pay attention and stay still, you must use something that pleasures them in order to get them to do what you want. Offering them treats while you get to work is one way of getting them to stay. You can apply Pavlov’s classical conditioning theory by presenting your dog with treats or some sort of positive reward every time you clean its ears. This way, your dog will learn to associate ear cleaning with a positive reward and encourage it in the future. It is immensely important that you use the proper tools for this task. You should avoid products comprising of any kind of chemicals, antibiotics, steroids, and alcohol as it might cause a negative reaction due to the sensitivity of the skin in that area. It is not recommended to use cotton swabs as their pointed and sharp tips have the potential to hurt the dog’s ears. Cotton swabs can be used on the outer flap of the ear but not on the inside as they can push the debris further into the ear canal. You can also use an absorbent gauze to complete the task efficiently. All the products being used during this process should be kept near you so that you are able to reach them quickly. You can work from the outside using your hands (gloves are recommended) and work your way inside until you feel a slight resistance. Do not push past that point as it can cause damage. Then, you can use a wet absorbent gauze to wipe the outer ear flap and clean the inner ear and rinse it properly. You must regularly clean your pet’s ears to properly avoid infections. The pet’s ears should be cleaned at least once a week. If your dog has a great amount of hair on its ear, make sure to get it removed as hair can restrict the airflow. This can be done by taking the dog to an animal grooming salon, but make sure the groomer does not pluck the dog’s hair as that not only causes pain but is also harmful. Additionally, it is important to keep your dog’s ears dry. After giving it a bath, use a towel to dry its ears. It is not recommended to use a paper towel or a cotton ball as it can leave fibers behind, which may cause irritation in the future. If you have a dog that is a swimmer, do not forget to dry out its ears after it takes a swim. 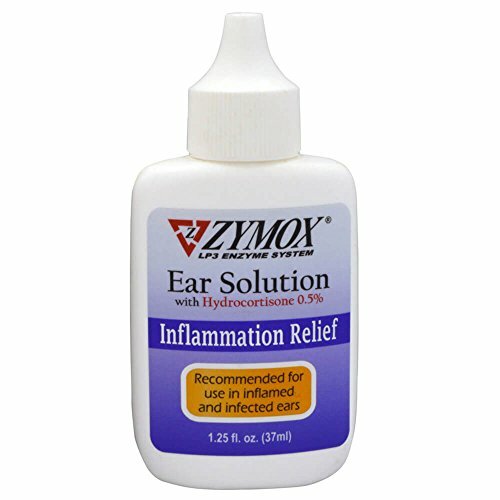 Zymox is one of the best brands of dog ear infection medications. It is one of the most effective medicine for otitis externa. It comprises of a combination of enzymes, which works to kill bacteria and yeast in dogs. It has ingredients comprising of anti-bacterial, anti-fungal and anti-viral enzymes which have shown astonishing results in cleaning dog’s ears and getting rid of infections. Furthermore, Zymox will not cause any side effects and cause your pet more harm. This brand of dog ear infection medicine has been proven to show positive results in just seven days for milder infections and fourteen days for chronic infections. Hence, it is quick, reliable and highly effective. It should be applied to your dog’s ear canal and gently massaged onto the affected area. You must not clean your dog’s ears before applying it as that action might interfere with the enzyme activity. Zymox has been very popular among dog owners. It has been rated 4.8 out of 5 stars on Amazon. Many consumers have reported having a positive result, stating that it is economic, easy to apply and incredibly effective. 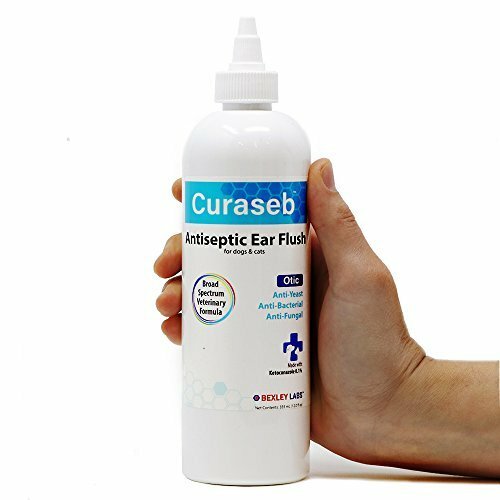 Curaseb is a great brand for treating dog ear infections. Its remedy does not only work on ear infections, but its specialty extends to the skin as well to solve various skin problems such as rashes, acne and salty patches on your pet’s skin. It comprises of alcohol-free, all-natural ingredients and it has an anti-fungal, anti-bacterial and anti-yeast formula containing prescription-grade ketoconazole and Tris-EDTA, which works together in the best way to treat your dog’s infection in a short amount of time. This amazing product also works its magic in a duration of seven days. As it comprises of natural ingredients, it is water-based with the inclusion of aloe vera which fights infections without causing any further pain. Not only this, but it also leaves behind a pleasant odor of melons and cucumbers. Curaseb is extremely popular among its customer base. It has scored 4.6/5 stars on Amazon. It was reported to have shown great results in just three days among some customers. It is cheap and effective and does not have an oily texture which is popular when it comes to dog ear drops. The best part about this brand is that it offers a money-back warranty if the product does not show results. 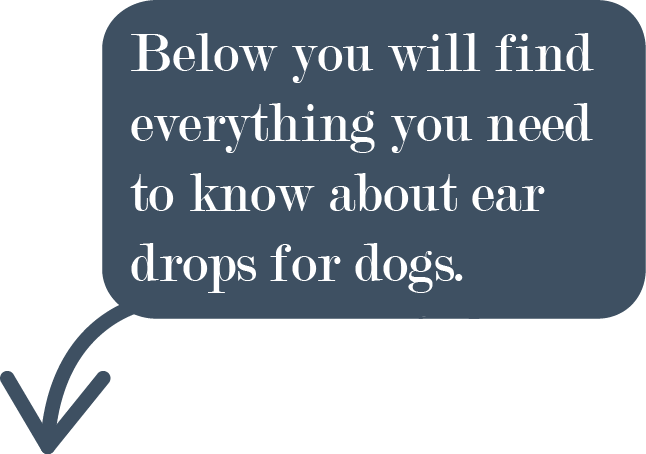 Ecoears is an all-natural, multi-functioning ear drop medication for dogs. It works best to remove any kind of itches, smells, discharge and debris that may have gathered on your dog’s ears. It is highly effective in reducing inflammation and redness. It has a unique eucalyptus smell which is pleasant to be around. The ingredients used in this brand of dog ear medicine are natural. It has no traces of steroids, antibiotics, pharmaceuticals and synthetic chemicals. Hence, it will not cause an allergic reaction to your dog. 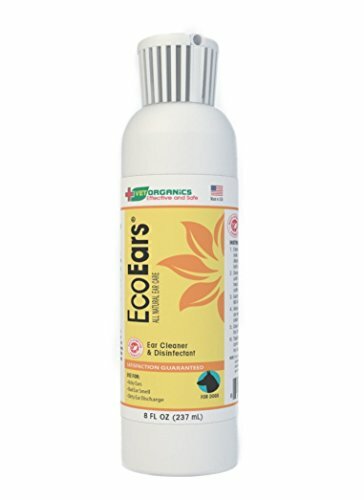 Ecoears uses nine natural ingredients which have been studied medically to have a positive effect on infections on dogs as well as humans. This product is manufactured in the United States, and its production facilities are registered by the FDA. It has great customer reviews and features a full money-back warranty if the results are not seen within a week. It has scored 4.5/5 stars on Amazon with customers raving about the effectiveness of its results in just one use. Hence, it has quick and effective results which can be observed in less than ten days. Mister Ben’s is one of the most effective brands of dog ear medicine. It also works with five all-natural ingredients to provide your pet with the maximum comfort possible. It provides fast relief from itching, redness, inflammation, infections and any kind of swelling. It also comes with a dropper so that it is easy to apply. Aloe vera: It comprises of antimicrobial, antibacterial, antiviral, and anti-fungal properties which disinfect and speed up the healing process and provide a hydrated and moisturized skin as a result. Boric acid: This is the best ingredient to battle yeast, mites and fungus. It also helps keep the ear dry. Povidone-iodine: It is a germicide and an antiseptic which works best to clean the area which has been infected or is about to be infected by releasing iodine, which is effective for killing bacteria, viruses, and fungi. Vinegar: It comprises of antimicrobial features which standardize the ear’s pH and removes ear mites. Isopropyl alcohol: It is an anti-fungal, anti-bacterial used to treat and heal infections and dry skin, kill mites and reduce irritation. Additionally, its evaporating tendency creates a cooling effect. It has good customer reviews, scoring a rating of 4.7 out of 5 stars. This product works best to keep your pet’s ears infection-free. It works by drying the dog’s ear canal and removing unnecessary cellular debris and ear wax. It removes the odor and discharge coming from the dog’s ears and is effective in reducing swelling, inflammation, and redness. It comprises of monosaccharides, which are highly effective in soothing the skin. Hence, it gets rid of irritation, providing your pet with a great level of comfort. Furthermore, it uses glycotechnology which reduces the bonding of microorganisms on the surface of the skin along with controlling the release of inflammatory mediators. It also features a neutral pH level, so it doesn’t cause a negative reaction. Keratolytic is also used in this formula to remove dead cells and unwanted debris, and it also features a drying agent to avoid future infections. It is well-liked by its customers and features a rating of 4.7 out of 5 stars on Amazon. It is known to be effective and quick at showing results. Not only does it work properly, but it also comes with a fresh scent which is pleasing to the nose. It is highly recommended and easy to use.